It’s the first day of spring. The weather is completely dreary and it snowed while I walked to the grocery store, but we made it! I might still need to wrap myself up in this sweater for awhile still, though. I took these photos in a bit of a rush, they’re not great – I probably should’ve put on some lipstick, hm? Pattern: My own. Bottom-up oversized raglan with knit-in seed stitch borders, i-cord edges, a little waist shaping and a nice long collar. I didn’t do buttonholes, with the intention of putting in a zipper. We’ll see how long it takes me to get around to that! 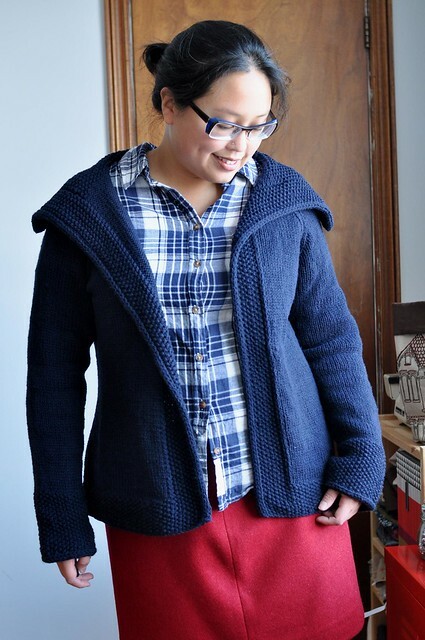 I’m not sure if I’ll write this one up – it’s quite basic, and I’m sure there are very similar sweater patterns out there already. I didn’t notice that line across the back yoke (dye lot difference, I guess, even though I bought all the yarn at the same time) until I was looking at the photos just now, but it won’t bother me. 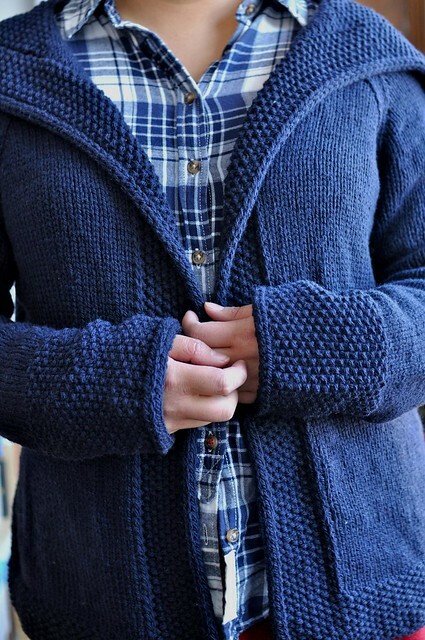 What a great sweater…love the simple styling and practicality. You did a lovely job. That looks very cozy, but definitely more elegant that a sweatshirt! I actually thought you did have lipstick on. You and the sweater both look great! Love the style! Didn’t even notice the line! It’s beautiful. I do hope you’ll write it up, though. It’s your combination of details that make it so special. It would take me quite a lot of work to put this together even one-tenth as elegantly as you have! And I double-love zipped cardigans. I love seed stitch too. 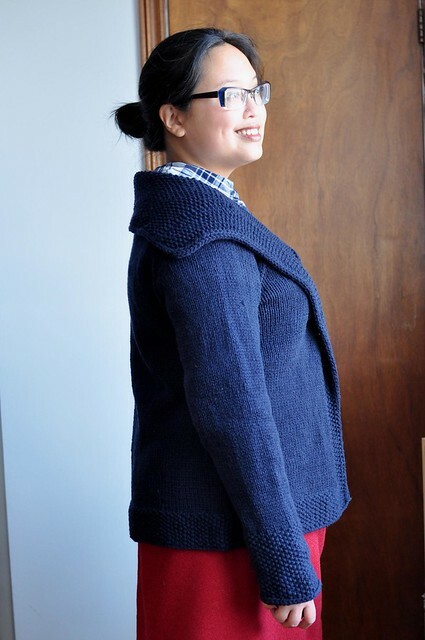 I hope you write a pattern because this is a great cardigan/jacket. I think the Diana/Diane’s are right…we need a pattern! 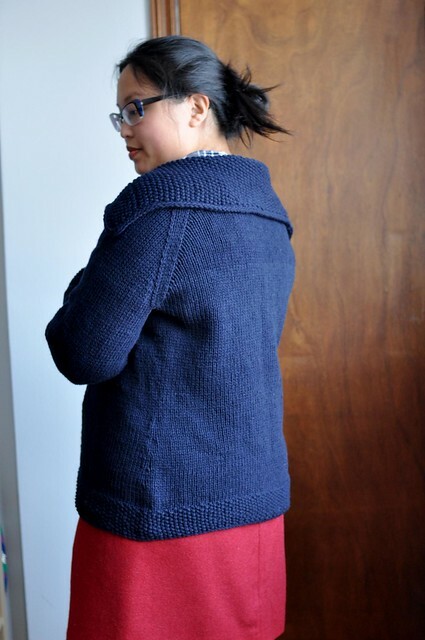 I think the sweater is gorgeous and you should write up the pattern. 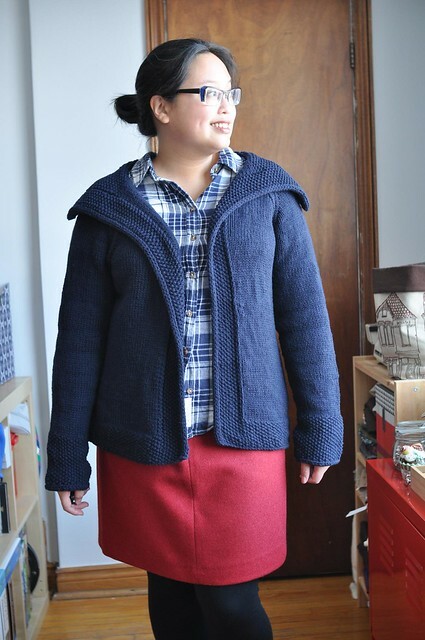 No there are not of other jacket cardigans quite like this one. Please write it up. Your patterns are extraordinarily well written! PLEASE write up a pattern!!! (with buttonholes). There is NOTHING out there like this. It’s classic with an edge, and flattering for so many body types. I’ve been searching for this for years! PLEASE!!! I join my voice to the requesting crowd. Please write up a pattern with your exquisite details. Love your work and choice of colors.